As a freelance writer, it pays to have a strong personal brand to show potential clients that you know your stuff. You probably already have a LinkedIn profile, and you may also be active on Twitter and have a business Facebook page but there are other less obvious ways to use social media to demonstrate your credentials and expertise. As a freelancer, it pays to have a strong personal brand. It may have a reputation for being predominantly about sharing recipes, fashion tips and wedding ideas but you’re definitely not wasting your time if you’re not focusing on these kind of areas. Pinterest can actually be an underrated and underutilized way to strengthen your personal brand and impress potential clients. You probably share industry content on other platforms and there’s no reason why you can’t do the same on Pinterest. Organize your pinned content into categories and create boards around these topics. Don’t be afraid to plug your talents on Pinterest. 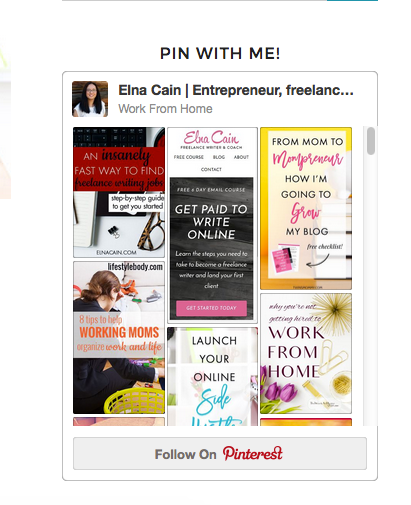 Lots of people visit Pinterest to get advice, and how-to pins are a great way to tap into this. If your content is providing value, there’s absolutely no reason why you shouldn’t promote it on a board that gathers together your published work. You might be trying to build your brand as a freelancer but that doesn’t mean that everything you pin has to be strictly business. Don’t be scared to create boards and pin things that reflect your personality. The great thing about Pinterest is that it’s okay to showcase a different side to who you are, which is less acceptable on Twitter and Facebook pages. It can also help you to get yourself out there to the wider Pinterest community by connecting you to people with similar interests. If you’re hoping to raise your online profile through Pinterest and reach prospective clients, you might want to think about having a Business account rather than a personal one. This makes it a lot easier to use Pinterest Analytics track traffic that is generated as a result of your pins. With Pinterest, you definitely can’t just pin and go. Give your pins titles and descriptions that will help them to be found in searches. Keywords are vital for making your pins more visible. It’s worth noting that hashtags don’t do much for promoting content on Pinterest so use them sparingly. Even if you’re fairly new to freelancing, you have hopefully got some connections on other social media platforms that you can leverage to kickstart your Pinterest following. You can connect your Twitter account to your Pinterest account with a Facebook profile. Optimizing your pins and profile for search will go a long way towards helping you to be discovered but don’t forget to add a widget to your website to show visitors that you are active on Pinterest. That way, they can choose to check you out and get an idea of your personality. This can be as simple as a “follow me on Pinterest” button or you can go a step further and use a widget that focuses on a particular board or your Pinterest profile as whole to give a glimpse of what to expect if they follow you. For example, Elna Cain does this on her TwinsMommy blog. Adding a Pin It button to images on your own blog posts makes it more likely that they will be shared on Pinterest. You can do this through Pinterest itself via the widget builders or if your blog is hosted on WordPress, you can use the Pinterest Hover Pin It button plug in (provided that your images are at least 120 x 120 in size). Joining and participating in Pinterest group boards in your niche is good way to boost your profile and drive traffic back to your blog or website. These are invite-only so it helps if you already have a connection with the board owner before asking to get involved. This can be done by sharing and commenting on their pins and generally trying to build a relationship with them so that they are aware of who you are and what you will bring to the group. Some group boards are only open to a select few pinners, as chosen by the board owner. Although you are using Pinterest predominantly to build your profile as a freelance writer/blogger, you don’t necessarily need to stick purely to group boards that are focused on this area. Joining group boards for some of your other interests can potentially widen your exposure to potential clients. You may be one of the few writers that are active in the group and by showing up in the group and regularly sharing high quality pins, you are making yourself known to them and being useful. How do you determine which kind of group boards are your best options? Regardless of the group’s focus, look for popular ones that have a high ratio of repins as this is more likely to mean that your pins are shared to a wider audience. Be sure to share pins from the group to encourage the likelihood that your own will be shared. To find groups you can look on PinGroupie or check out your followers’ boards and see what groups they belong to. Are you using Pinterest to build your writer brand? Do you have any tips that haven’t been covered here? Thanks for introducing us to the power of Pinterest for freelance writers. Not many writers are using this visual search engine and they’re missing out on great potential. I’ve landed a client simply from sharing a pin on a group board. It got the attention of an editor and they hired me to write similar content as my pin! Win-win! I especially like group boards for bringing traffic too. They are awesome! Thanks for having me on the blog, Elna! There’s definitely great potential with Pinterest for us freelance writers, and so great to hear that you’ve already had success with it! This is great! I love Pinterest but I honestly under-utilize it for marketing my writing brand. I hadn’t thought of adding a portfolio board like Carrie Smith. I’m going to hop over and do that now! Great tips! I agree, the portfolio board is a great idea. I really haven’t thought of that. Great post! I’ve been wanting to use Pintrest to boost my social connections but wasn’t sure exactly how to do it. I have an account, I just don’t know how to use it, lol. Thanks for your helpful advice. It’s not as hard as I thought it would be. Absolutely … I don’t think Pinterest is any harder to use than any other platform once you get past the idea that it’s not going to work for us freelancers! It’s just a case of looking at it differently and working to make your pins attractive and likely to show up in searches. Beyond that, you can do a lot of similar stuff in terms of sharing content. Thank you for the insightful tips for self promotion and social media. Being new in the field, I got a lot of ideas that will allow me to expand my online presence. I hope the tips help, Ann! Thanks for a great post Sally! Absolutely – you can have a few boards to show a slightly less “business like” side of who you are on Pinterest and it doesn’t take anything away from your personal brand, as long as they’re not the first ones that people see.